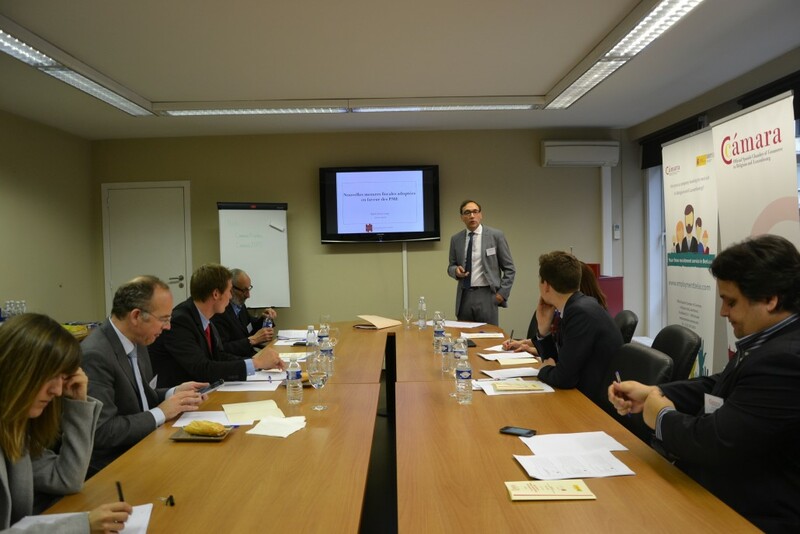 Last June 22th, the Chamber organized in Brussels, in collaboration with one of its members, Wantiez, Bailleux, Causin & Janssen Bruxelles, the conference “New measures adopted in Belgium in favor of the the SMEs”. Belgian representatives of the economic and fiscal sector attended to this event. Rafaël Álvarez Campa, prosecutor of Wantiez, Bailleux, Causin & Janssen Bruxelles, presented the new fiscal measures adopted in Belgium to the federal and regional level for the small and medium enterprises. The speaker explained in detail the different measures and, later, the assistants had the opportunity to ask some questions. One of the new fiscal measures at a federal level is the “tax shelter for the SMEs”. This recent measure is designated to every individual subscripted to new nominal shares or to the parts of a company recently set up with the reduction of taxes as a main fiscal advantage. Nonetheless, the speaker highlighted the impossibility to combine this fiscal measure with others, as the exclusion of the leaders of the societies as direct beneficiaries. Within this category, the individuals subscripted to shares or to parts belonging to crowdfunding platforms and fund starters with a maximum to receive of the 250,000€ are considered direct beneficiaries. Also the SMEs are required to meet some requirements, as the necessity to own a document that points out some relevant data as the year of the acquisition of the shares and its continuous verification year after year. More precisely, the companies within this category were classified by size attending their general conditions: medium and small size enterprise, and other pertinent characteristics. There are excluded of this fiscal measure the societies created out of a fusion or division of other societies, real estate companies, management enterprises, investment and treasury companies or societies in process of juridical reorganization. When it comes to the general conditions needed to benefit from this fiscal measure, the speaker pointed out some requirements for the societies to fulfill like the date of constitution (not later than January 2013) and the starting of its activities within the consecutive 48 months after being constituted. The company can be Belgian or foreign but established in Belgium. Later on, the speaker talked about more specific cases related to small and micro societies. He highlighted the steps to follow in order to obtain the already mentioned fiscal advantages designated to Belgian residents and no Belgian residents. Within the measure “tax shelter”, the speaker emphasized the several direct or indirect investments with the help of an intermediator or starter found. Secondly, it was explained the new fiscal measure of declaration of suspension of payments for individuals/SMEs that has been recently constituted. The speaker also talked about the possibility of not paying the totality of the professional retention, which represents a 10% for the natural persons and a 20% for the micro societies that comply with the criteria of the micro societies. The beneficiaries of this fiscal exemption are the individuals and societies of recent creation registered in Banque-Carrefour up to 4 years. It is necessary to comply with some formalities to enjoy this fiscal advantage, as it is to have proof of documents of nominative and justified data of the already mentioned needed conditions. The individual and societies out of this fiscal measure are the employers in situations of difficulty or dissolution. The speaker also mentioned, as a peculiarity of this measure, the possibility to gather it with other fiscal exemptions. In third place, the speaker introduced the next measure at the federal level. This is the exemption of interest payments of loans for emerging SMEs acquired through a “crowdfunding” platform and oriented to finance “new economic initiatives”. The three main advantages of this tax measure are: the exemption of the first 15,000 € borrowed, the limit exemption of interests the four first years of loan, and the exemption per year and per contributor. In the case of being exempted, there is no need to be declared by the lender. Nevertheless, including in the tax return the number of crowdfunding loans obtained will be needed. Afterwards, the speaker wanted to outline that the concept of crowdfunding is not completely tackled in the Belgian legal system. However, for this measure to be executed, there are three players needed: a crowdfunding platform, which works as an intermediary, the entrepreneur and the investor. Once introduced this measure, the speaker explained at greater length the conditions for these players to be considered as so. Firstly, the firm engaged does not have to be necessarily Belgian o set up in Belgium. Secondly, the investor must be an individual with a proof of title, that in case of being the owner of the firm, will be excluded from this exemption. At the Belgian federal level, the fourth and last tax measure was introduced with the name of “investments in digital sector”. This measure consists of a fiscal deduction for all those individuals and SMEs investing in capital and digital assets. The players who will benefit from this measure are SMEs. Nevertheless, a set of criteria is needed for being considered as SME, such as having less than 4.5 million assets and a number of employees below 50. Regarding investments in this sector, the general concept consists of integrating and exploiting digital invoicing and payment systems online. Investments in IT and digital equipment that enables invoicing, storing or singing digitally will be promoted. In conclusion, it could be said that investments considered in this new tax measure aim to reinforce security and privacy of ICT. The tax advantages obtained with this measure will be tax deductions when investing on digital capital and assets. To finalize the conference, the speaker introduced tax measures at regional level in Belgium. The measures presented were: “coup de pouce”, loans in Wallonia, and “win-win” loans in Flanders. The speaker spoke about the first measure outlining as one of the conditions to be benefit from it as to be legally stablished in Wallonia. “Coup de pouce” loans are loans to a SME or individuals (being the maximum quantity per contributor 50.000 € and 10.000€ per lender). In exchange of this, the recipients could have a reduction of taxes, being excluded housing companies, management companies, companies in reorganization, companies created from a fusion or companies listed in the stock market. The speaker outlined as well the importance of the nature of the loans, which only given for entrepreneurial activities. The second measure, “win-win” loans in Flanders, was introduced to the participants outlining that, in this case, the lender should be one Flemish SME, independently from the number of years from its establishment. Many of its characteristics are similar to the previously stated measure. Àlvarez Campa finalized his intervention with a Q&A session. Among them, it can be outlined the case of tax reductions when hiring a first worker, that is, an exemption to the contribution to the Belgian social security. The speaker explained at great length this exemption with the example of tourist and hospitality sectors, sectors where of unreported employment is frequent and some regulatory tax measures are required in order to prevent that unreported hiring.